. :: TRAVELLING TO RIO ::. When it comes to horses, but especially Olympic horses travelling riders, grooms, vets and airport workers must consider everything! Does a horse get jet lag? Travel sickness? In-flight bacteria? Do they have enough Leg room considered? There will be more than 300 horses competing in Rio, with some 200 of them travelling from hubs in Stansted, Liege and Miami. So how hard is it to get a horse to the other side of the world? Imagine dropping six tonnes of food on to an aircraft filled with horses, each with an individual limit for the flight which includes its own weight plus items such as water buckets, tack bags and rugs! Besides the weight of the horses and the food there's nearly 10 tonnes of equipment and several tonnes of haylage (normal hay with a higher moisture content) for the flight! 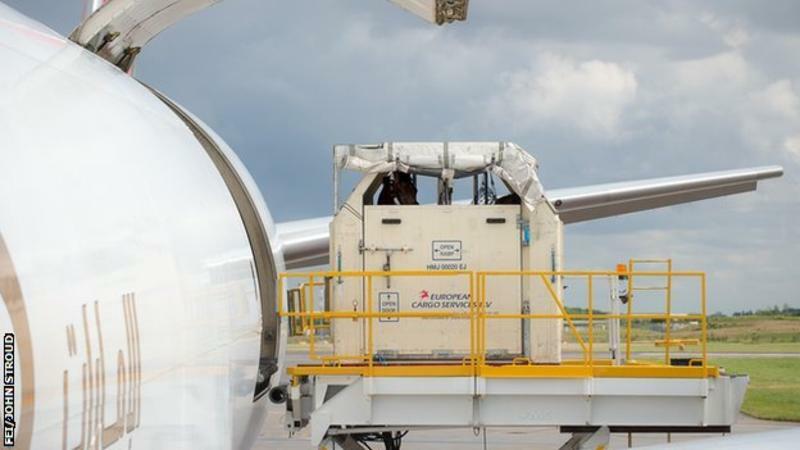 There were be 34 horses on board when the first flight left Stansted on the 30th of July, with a combined weight of more than 17 tonnes and a value running into millions of pounds. Horses are loaded into stalls on the ground and then pushed up into the plane. This where both the calmest and even the spookiest will cause some damage! So it is not uncommon for the horses to feel unconfutable with all of the movement, odd environments and loud noises from the aircraft! Each stall is designed to accommodate three horses. Some horses might prefer the space entirely to themselves but the horses are generally happier in pairs, according to British Eventing team vet Liz Brown. And according to the International Federation for Equestrian Sports, the seating (or standing) plan will also ensure stallions are at the front of the plane away from the mares. The horses will stand for the duration of the 12-hour flight. Allthough horses most definitely find it an odd experience, once they have taken off, crossed the turbulence and settled in the experience could be even better than them standing in the hot trailer, with the speed bumps and the sharp turns! At least the aircraft will have controlled temperature just for the horses! "Horses are designed to sleep standing up," said Liz Brown. "Their hind legs have a locking mechanism so they can stabilize”. It is important to always have hay near the horses as the chewing does not make the react to the cabin pressure as much as they would without chewing! What state do the horses arrive in? "It's really hard to know if there is jet lag for a horse," said Brown, who worked with the British team at the 2008 Games. Team GB's 15 horses will have a light leg stretch the day before take off and again on the day of arrival. They will be fit enough to compete well before competition starts on 6 August. "If they had a good journey, they would of actually arrived well rested and come out of it fresher," said Breisner. "If they have dehydrated at all or lost a little weight during the flight we will look to replenish that. Horses can rehydrate much, much more quickly than humans. A horse will be back to normal in 24 hours. One of the biggest risks is an infection it’s called Pleuropneumonia, that’s why it is important that the vets and grooms check to make sure that the horses head is always in the right position.